[Jesus said,] "There is so much more I want to tell you, but you can't bear it now. When the Spirit of truth comes, he will guide you into all truth. He will not speak on his own but will tell you what he has heard. He will tell you about the future. He will bring me glory by telling you whatever he receives from me. All that belongs to the Father is mine; this is why I said, 'The Spirit will tell you whatever he receives from me.'" Why do we trust the Gospel message we have received? There are at least two reasons: 1) The Spirit led, reminded, guided, and revealed the things of Jesus to his apostles as they shared the story of Jesus, and 2) we have the Holy Spirit inside of us helping us to discern the truth of the message about Jesus. Give me wisdom, dear Heavenly Father, to know falsehood when I see it. 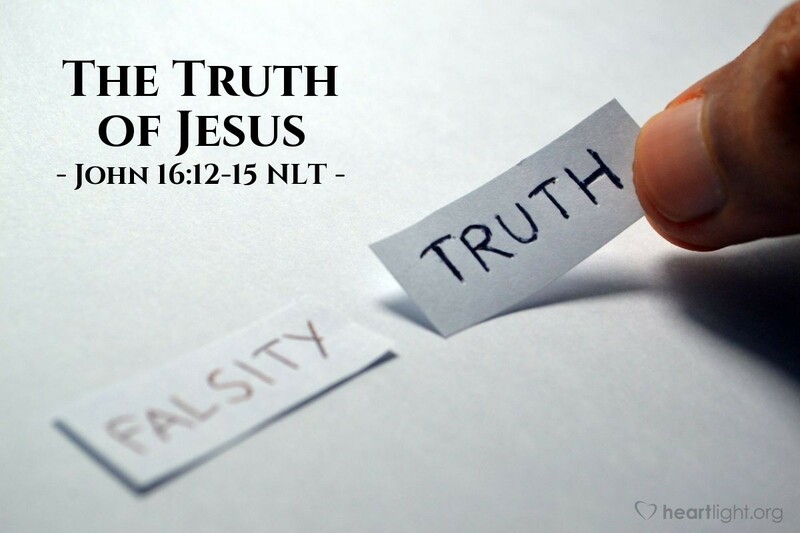 I want to know Jesus and to honor the truth about him in my heart, my head, and my life. Help me to know the truth in Jesus and the freedom it brings. Touch my heart by Jesus' words and example, and call me to minister in his name. Make my life one of integrity and grace that reflects your Son's glory. In Jesus' name, I pray. Amen.